I am very pleased to bring you an exclusive interview with Cisco Ferreira about his involvement with Drexciya/Heinrich Mueller. He is a man who within electro/techno circles needs no introduction but to give him the respect he deserves I‘ll give him one anyway. He has been involved in the UK dance scene, DJing and producing, since pretty much the very beginning (1986) and today is known and continues to play around the world on a regular basis. Solo and as The Advent (from 1993-1999 Colin McBean was also in group) he has been responsible for so many amazing tracks, many seminal, which have moved so many minds and dance-floors. In fact when I first started getting seriously into underground dance music and began buying 12 inches it was The Advent that helped educate me. This is only the second person I have approached, the graphic artist Abdul Haqq was the other, for their memories of working with and opinions of Drexciya/Heinich Mueller and so far I am on a role which I hope continues. Not sure who my next target will be but whatever happens happens. I am just grateful for any pieces of the Drexciyan puzzle which come my way, how ever small, and am glad to share them. 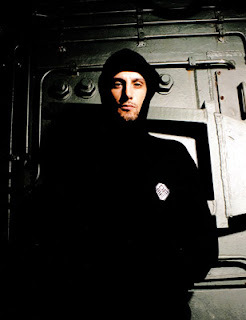 Q: I believe you were the first person to licence any Dopplereffekt material outside of the United States in 1997 on the Kombination Phunk compilation. Can you talk about how you first came across their music and what impression it made on you then. A: I didn't realize that. I knew that those tracks were Hot and I needed them on this compilation and luckily we got two tracks approved. Q: Was it an easy process to get in contact and licence the material? A: Nope, we got our record company (BMG) to get in touch and go through the proper channels which all worked out perfectly. Q: You added some subtle touches to these tracks, ’Pornoactress’ and Plastiphilia’, how was this done and why? A: Yes I was into tape editing in a big way, back in the day's before DAT & CD, so I wanted to add the same analogue feel, so a Studer 1/2 inch tape was hired from "Studio Hire" for this whole Kombination Phunk project. Q: Dopplereffekt of this period would have quite a prolonged impact on modern electro and on some other electronic music genres of the time. How influential were they, what is your opinion? A: Very.. as they for me took off where Kraftwerk left off. Q: Were you also a fan of Drexciya, how did you discover them? A: Was always a big fan of all things electro that came out of Detroit. Doesn't get any better than Drexciya. Q: When in 2002 your label, Kombination Research, released Abstract Thought's 'Hypothetical Situations' album from Drexciya's Storm Series, was it a matter of it just being offered out of the blue or did you seek it. Had you maintained a continuous contact from before? A: This I don't want to go into, but for sure it was a blessing to have this important piece of work. Q: Did you deal with Gerald Donald or James Stinson? A: Cannot disclose this information. Q: The music on the album still sounds pretty amazing and timeless, when you first heard it what did you think? Any favourites? 'Galactic Rotation' is a bit of a monster. Q: I remember a friend of mine had this on white label for months before it came out, was there a problem or was this how you planned it? A: I did have some drama with my previous distributor that put this out and I was disappointed they didn't do more to push this release. They were "ELP DISTRIBUTION" run by Corrado Izo. (he ended up shutting down just after I released it). Q: The artwork is credited to Dimensional Waves Imaging and Oblivion Visual Concepts. Do you know if this was the group themselves or an anonymous outside party? Were they very particular about the details of the text, eg. ‘Music beamed through Dimensional Waves by Abstract thought‘ and the deep abstract thought email address? Did you or they include the 'Drexciya Storm #4' line? A: What was given to me on text is what I put. Oblivion Visual Concepts is a company here in Portugal that did the final artwork, is run by DJ A Paul. Q: How has it sold to date? A: I didn't do this for the sales figures. I did it because I'm a big supporter of electro and to have a release like this I felt honoured to have it on my KR Label. Q: As a record label owner and music producer that actively uses artwork and titles etc to tie all of your work together and give it depth, like Drexciya, in an age where collecting music has become for many reduced to file sharing and downloading how do you feel about this? A: Well times have changed and we can't ignore this, with records/vinyl it had a physical identity, now an MP3 in your hard disk doesn't quite cut it for me, technology is changing. Q: You worked again with Heinrich Mueller on your ‘Recreations’ project in 2003. Mueller’s track is pretty phenomenal and very different to what he was producing at the time. Where you pleased with what he did with your music? A: Very pleased, like I said I’m a fan of this music and to have top level artists remixing and doing releases, I’m very honoured to have. Q: What are your own current artistic activities and plans for the future?